Not only does the Bay of Plenty offer the chance to observe and interact with dolphins, but it also gives you the opportunity to experience other marine life in its natural habitat. The outlying islands of the Tauranga harbour are also home to New Zealand Fur seals. Observing these streamlined and playful creatures is a truly magical experience. Large congregations of school fish, including tuna, mackerel, kahawai and trevally, are commonly seen in the deeper regions of the ocean outside the harbour. The sight of thousands of large school fish breaking the surface is extremely impressive. New Zealand has the greatest diversity of seabirds anywhere in the world. 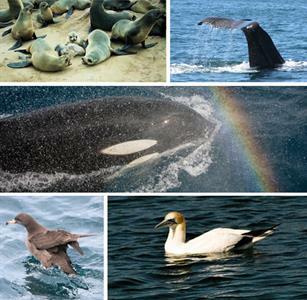 This is due to the rich and abundant marine environment and the Bay of Plenty is home to the gull, shag, petrel, gannet, shearwater, albatross, and New Zealand’s own blue penguin. Learn more about the Bottlenose dolphin (Tursiops truncatus), the species that most people visualise when they hear the word ‘dolphin’. The Common dolphins found in New Zealand are Short-beaked Common dolphins (Delphinus delphis). They can be distinguished by their shorter beaks and distinctive colour patterns. It is the Bottlenose (Tursiops truncatus) that most people visualise when they hear the word ‘dolphin’ as is the most well known and studied species. Discover the New Zealand Common Dolphin (Delphinus delphis) - identified by their short beaks and distinctive patterns. The New Zealand Common Dolphin (Delphinus delphis) are identified by their short beaks and distinctive patterns.